On April 22nd I participated in the Bistro Aix Earth Day King Estate Wine Pairing dinner where they paired sustainable foods from the King Estate Winery with their YUMMY wine! My great friend Keli accompanied me on this delicious excursion. I was thrilled to support an evening that supported sustainability. According to Chef Tom Did approximately 60% – 70% of Bistro AIX’s everyday seasonally-inspired menus consist of made-in-house, artisanal, local, organic and sustainable items. Prior to being diagnosed with Celiac disease I would not have thought twice about such a decadent occasion, however prior to committing I had to make a call to the catering manager Parker to make sure they could provide a gluten free meal. After a resounding YES I encouraged girlfriends of mine to attend. 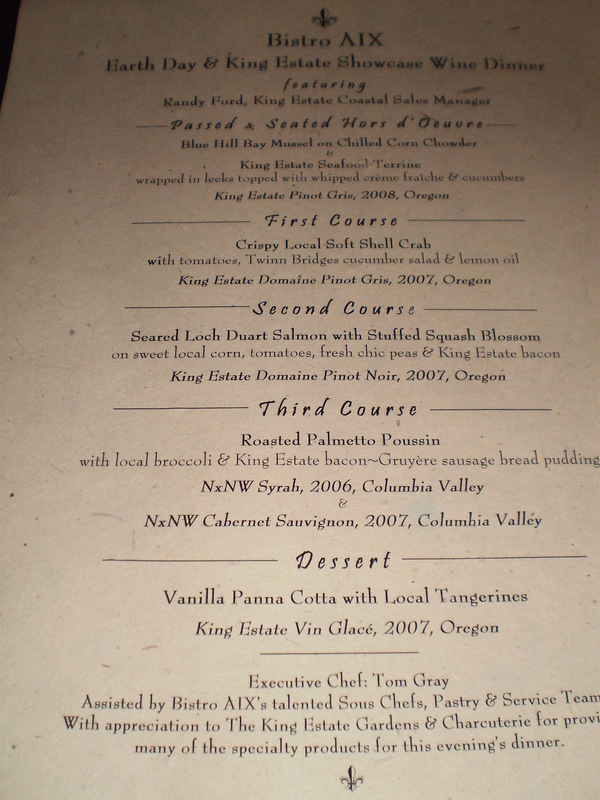 Not only is King Estate one of my favorite brands of Pinot Gris, but this was one of the few wine pairing dinners I have seen under $100. Upon arrival, each guest was welcomed with a glass of 2008 King Estate Pinot Gris (pronouced pee-no- gree) and mussles on a bed of corn chowder- YUM! I was quickly identified as the gluten free girl and was assured once again I would be taken care of. After a few tastings of the muscles, we made our way to the main dining area where the tasting would occur. I love this room, it is cozy and just off the Onyx Bar. In the theme of Earth Day, each of the name plates were little recycled coffee tins with decorative contact paper with lovely local plants. The menus were made of paper you can plant. They thought of everything. We were seated next to the featured guest speaker Randy Ford, from King Estate, and his equally cultured wife. Next, we enjoyed Crispy Local Soft Shell Crab. Immediately I think I will not be able to enjoy the “crispy-ness” because it will be made from bread crumbs or flour of some sort, however, they bring it out and it is crispy and gluten free (I am guessing they used a corn meal or corn flour of some sort). 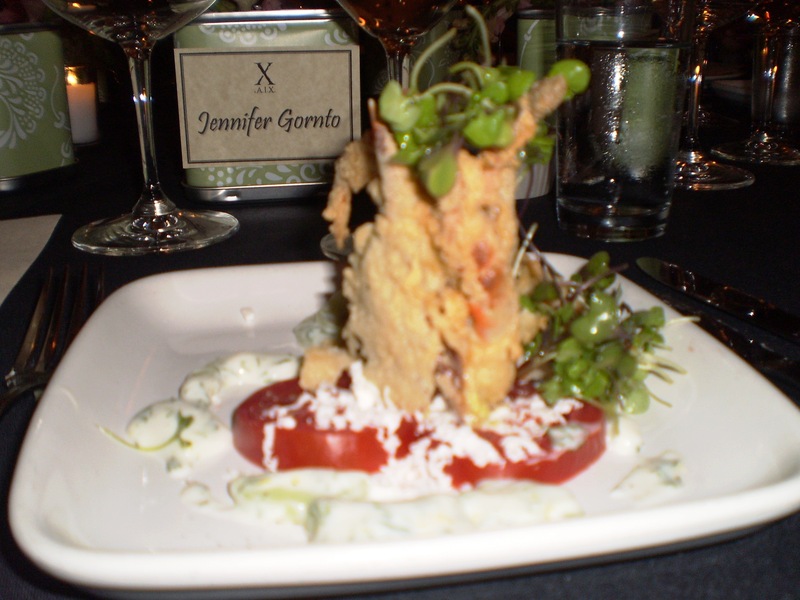 View photo of the Crispy Local Soft Shell Crab. This was paired with the King Estate Domaine Pinot Gris. Domaine wines are made exclusively with organically grown grapes from the Kind Estate vineyard. I loved this wine. It went perfectly I wish I could have asked for another glass, but luckily I knew I would have plenty of wine tonight. Next up Seared Loch Duart Salmon with Stuffed Squash Blossom. It was again delicious and Gluten free. This was paired with the King Estate Domaine Pinot Noir- hands down the best wine I had all night and I am a white wine drinker most of the time. Next on the list was Roasted Palmetto Poussin (young chicken) with local broccoli and King Estate bacon-gruyere sausage bread pudding paired with NxNW Cabernet Sauvignon and Syrah. (At some point during this course a rendition of Les Poisson from The Little Mermaid was sung. Not sure if I started it, however Poisson is fish. It helped our table bond, but I digress). Of course, as someone with Celiac disease, bread pudding is a HUGE no no, however, the variation of my tasting was adorable. Instead of the bread pudding they used marscapone as well as the King Estate sausage. It was served in the cutest little coffee cup which made it taste that much better. The evening was finished off with a Vanilla Panna Cotta with Local Tangetines with King Estate Vin Glace. The dessert tasted just like a cream sicle and the presentation was adorable. I wish I had taken a photo of this, however, I could not wait to dive in so there was no time to whip back out the camera. All in all it was a great night, the meal was Bistro Aixcellent! I hope to join in on another in the near future. So glad you enjoyed the dinner! I work at Aix and it’s great to know you enjoyed the event as much as we enjoyed preparing it.